For the past few seasons, the New York Mets have instituted some quirky post-game victory celebrations in the clubhouse. In 2015 and 2016, former outfielder Michael Cuddyer awarded the team’s player of the game with a WWE-style championship belt. During those seasons, the Mets reached the post-season in back-to-back years for only the second time in franchise history. Last season, the player of the game wore a king’s crown during post-game interviews. Unlike the previous two seasons however, a litany of injuries resulted in the Amazins’ finishing with a 70-92 record – fourth place in the N.L. East. This year, the “salt and pepper” celebration has caught on, thanks to new third baseman Todd Frazier. After each win, Frazier awards a custom-made pepper grinder to the game’s standout performer. While we hope the wins start piling back up for the Mets this season after a torrid start, there’s another team in Flushing that has adopted a unique post-game celebration. Head coach Steve Adams and assistant coach Austin Nieves came up with the idea prior to the start of the regular season. Nieves, who played at Holy Cross for Adams, recently graduated from Molloy College, Rockville Centre, L.I., where the baseball team had a similar ritual. After each victory, the Knights shake hands with their opponents and huddle in the outfield for a post-game talk with Adams. Rather than simply give the Golden Sword to the player of the game, Nieves has that player kneel down to be symbolically knighted. The player – or sometimes multiple players – leads the team’s chant in the final huddle. He then poses with the sword for a photo that gets shared on the team’s social media accounts. The sword itself is simply a child’s toy purchased at Target. However, that simple toy has been something the Holy Cross players have rallied around all season. “It is helping us win because we’re all looking forward to getting it. 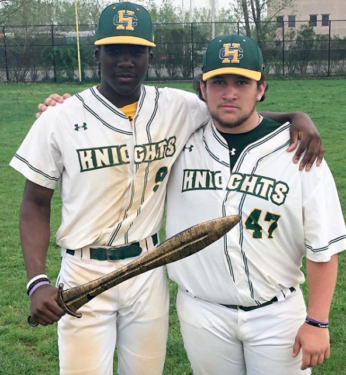 So everyone wants to play better,” said John Callahan, a junior pitcher and corner infielder from Whitestone who leads the Knights with five Golden Swords this season. Baseball is of course a team game, so even though only one or two Knights receive the honor, the players know that it takes multiple clutch performances to win. In fact, the Golden Sword has been spread out quite nicely among the team’s roster. Adams said the tradition would continue moving forward. With the playoffs upon us, the Knights hope to be giving out a few more swords during the next few weeks – signifying a deep post-season run.